As a key witness, he holds many of the answers about the killing of a former BJP minister in Gujarat, and his assassins. That is why he fears for his life. New Delhi: Only a few days ago, Azam Khan, one of the key witnesses in the controversial Sohrabuddin Sheikh fake encounter case, gave a new twist to the court proceedings. In his recent deposition at a Mumbai trial court, the Udaipur-based gangster said that Gujarat top cop D.G. Vanzara had ordered the killing of former BJP minister Haren Pandya. Since Vanzara was considered close to now BJP president Amit Shah and the then chief minister of the state Narendra Modi, his statement threw the mysterious Haren Pandya murder case back into an unsettling spotlight. Today, Khan is lodged at an Udaipur prison and fears for his life. His wife and other relatives have complained that Khan is being tortured in jail and is gravely injured. They also said that Khan is being threatened by some police personnel to stop speaking about the Sohrabuddin encounter case. According to his wife Rizwana and his lawyer, to ensure that he follows their directions, the police have allegedly opened nine new cases against him and have threatened that if Khan does not toe the line, he could also face fake murder charges. Khan, Sohrabuddin and Prajapati were associates. 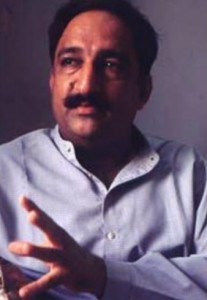 In his testimony before the Mumbai trial court, Khan had said that Prajapati had told him that he was tricked into giving information about Sohrabuddin to the police. The police had told Prajapati that there was “political pressure” to arrest Sohrabuddin and that if Prajapati gave them the information they required, he would be released. According to what Prajapati told Khan, Sohrabuddin and his wife Kausar Bi were killed in a farmhouse in Gujarat. Khan also told the court that Prajapati too was fearful of being eliminated and therefore, lodged a complaint before an Ahmedabad court. “I last met Tulsiram on December 23-24, 2006, when I was being taken into custody for some old theft case pending against me. He was being to be taken to Ahmedabad for a court hearing. He had told me that either one of us would be killed,” Khan said at the CBI trial court on November 3. Sohrabuddin Sheikh and Kauser Bi. Later, Khan found that Prajapati had also been killed in an encounter which the police claimed was a result of Prajapati trying to escape from custody. Since then, Khan spent years trying to remain underground as much as possible, trying to divert police attention from him. However, as the CBI faced court pressure to bring Khan to testify, Khan’s relatives claim the police began to mount pressure on the family sometime in June 2018. On June 11, when Khan was underground, his mother Husaina Banu petitioned the chief judicial magistrate of Udaipur that her two other sons and one brother-in-law had been illegally picked up by the Udaipur police. In the petition, a copy of which is with The Wire, she said that when she met the police officials, they told her that the three would be released only if Khan said what the “upar ke adhikari” (higher officials) want him to say in front of the court in the Sohrabuddin and Prajapati encounter case. The petition further says that the police officials wanted Khan to change his statement and that her sons had been picked up on the orders of Sudhir Joshi, Additional Superintendent of Police, Udaipur – who too is a witness in the fake encounter case. She also told the CJM that the police officials threatened her, telling her that if Khan does not stick to the tutored statement, he would also be killed in an encounter. “The police is trying to send him off to Ajmer prison and he fears that he will be killed in an encounter during that journey,” says Khan’s wife Rizwana. She also claimed that her sons, Akhtar and Aslam, had nothing to do with Khan’s illegal activities. However, in its reply, the police claimed that the three were picked up for sometime in connection with some other illegal activities but were not kept in any illegal detention. The police also said that it had information that the three relatives were part of the extortion racket that Khan managed. The police replied and released the three after a week – only after the court issued a search warrant. Mogra, Khan’s lawyer, told The Wire that the police was forced to release them as Khan’s family was planning to move a habeas corpus petition against the illegal police action. Later, Mogra alleges that the police forced the three to write a letter that they had gone to Ajmer on pilgrimage without informing their families. “You tell me – who goes to Ajmer Shareef without informing his family?” Mogra asked. On August 12, 2018, Khan’s wife Rizwana then sent a similar letter to the Chief Justice of India, the Chief Justices of Rajasthan and Maharashtra, the National Human Rights Commission, the President of India and many other political leaders like West Bengal chief minister Mamata Banerjee, Delhi chief minister Arvind Kejriwal, Congress chief Rahul Gandhi and so on. Also read: Mystery over Haren Pandya Killing Deepens After Witness Says Top Gujarat Cop Gave OrderIn the letter, she adds that on one evening, a few non-uniformed policemen accosted her on a “black pulsar” bike and asked her to meet one “netaji and sahebji”. When she refused, they forcefully took her with them. Thereafter, she alleges that she met a person in a “white dress” who told her that if Khan does not give a tutored statement in court, he “will not survive”. “A person in the car said that government is there and CBI works according to them and all courts of India from CBI to Supreme Court have appointed our judges and no one says anything against us,” she said in the letter about the person she met in the car but could not recognise. She also alleged that the person talked about Justice (B.H) Loya and made his death an example of what may happen to Khan if he did not follow his directions. She also claims in the letter that Khan knew about Justice Loya’s “death reason”. Also read: New Evidence, Old Lies on the Murder of Haren Pandya, Modi’s Early RivalRizwana, therefore, pleaded before the justices that the court should provide a security cover to her family and ensure that Khan gives his statement at the Mumbai court “without any pressure”. She added that Khan, who has always been accompanied by multiple security personnel in other cases, is being guarded by only two policemen this time around. That is the reason, she claimed, that Khan had requested the court to be handcuffed during his transfers from jail to the court and vice-versa. “At least that way the police will not be able to claim that he was trying to flee,” Rizwana said. Mogra too said that Khan was has been tortured since October 12, and even after he gave his statement at the court. One of his legs appear to be badly bruised, he said. Mogra and Khan’s family are currently requesting the court that Khan be kept in judicial remand and be allowed to give a full statement in the fake encounter cases again. A thorn in the eyes of the powerful? “Now that Vanzara is no more in the good books of some top leaders of Gujarat, it is more than likely that he will be made a scapegoat. Many more people – ranging from top police officials to prominent politicians – will land in trouble if Khan discloses everything he knows,” he added. Khan, too, had written to the CBI judge earlier – a copy of it is with The Wire – that he knew “saare raaz” (all secrets) about the encounters of Sohrabuddin and Tulsiram Prajapati. He further said that he wanted to disclose every detail in front of the court, but he fears that he will be killed in an encounter before that or will be unnecessarily slapped with false charges. Vanzara himself had written to the additional chief secretary in Gujarat on September 1, 2013, that he was only implementing the “conscious policy of the then (state) government“. This had raised many questions about the conduct of the then Narendra Modi-led BJP government in Gujarat. Given the high profile of the case, Mogra has demanded that Khan be given immediate protection as a witness.